If there’s one thing Donald Trump probably never intended for his imploding improbable presidential campaign to accomplish, it’s help tourism in Mexico. During the third and final presidential debate, the Republican nominee extolled his immigration policies, explaining that a growing number of “bad hombres” who speak Spanish are to blame for the disastrous state of our nation. The idea of “bad hombres” -- which in Trump’s mind probably looks like a hypothetical Bad Boys 2 remake set in Tijuana -- quickly pinged across the internet, becoming one of the evening’s lasting soundbites. 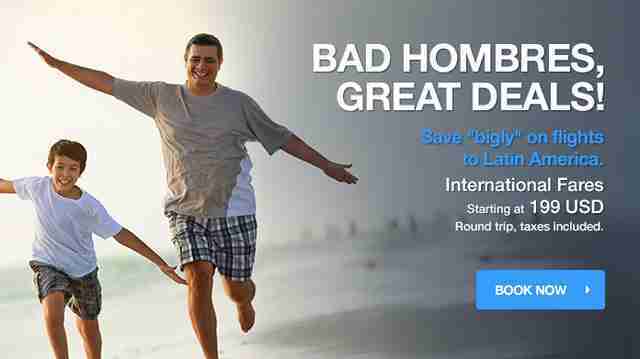 The phrase conjured such a firestorm, in fact, that Aeromexico is using it to market budget trips to Latin America. 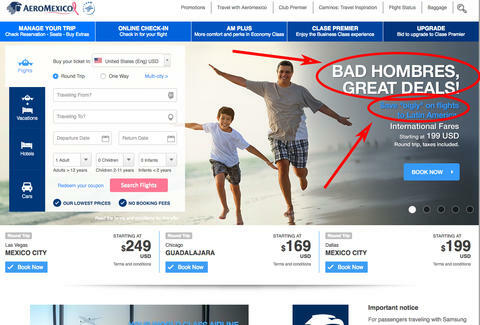 As you can see, the airline is tantalizing would-be tourists with the tagline, “Bad Hombres, Great Deals!” Aeromexico hawks the promise of saving “bigly” on international fares starting at $199, using the Donald’s lingua franca in a brilliant display of trolling. While Trump has been afforded enough free press to keep his aura afloat for the next thousand campaign seasons, it seems the tycoon is lending his own marketing genius to a Mexican airline, and for zero cost. (SAD!). And for what it’s worth, the deals don’t look half bad: If you’re interested, you can head from Las Vegas to Mexico City for $249, Chicago to Guadalajara for $169, and Dallas to Mexico City for $199. "We watched the third debate last week and we just felt like having fun. By now the entire world is engrossed in these elections so we came out with something we thought would resonate with people. And yes, it did indeed provide us with the perfect angle to attract even more Americans to visit our beautiful country, which has so much to offer in terms of business, culture and beaches." Good on you, Aeromexico. Good on you.